The last tour finished well with a full day at the Regua Wetlands! We had a great day with many new species including Rufescent Tiger Heron, Common and Purple Gallinule, Wattled Jacana, Muscovy Duck, Brazilian Teal, Neotropic Cormorant, Anhinga, Green Kingfisher, Amazon Kingfisher, Greater Ani, Silvery-flanked and Unicoloured Antwren, Southern Antpipit, Sooretama Slaty-Antshrike, Grayish Mourner, Yellow-backed and Flame-crested Tanager, Blue-winged Parrotlet, Brazilian Tanager, Rufous-capped Motmot, Reddish Hermit, Scaled Antbird, White-bibbed Antbird, Elegant Mourner (aka Shrike-like Cotinga) and Tufted Antshrike! A very productive last day! Trip report coming soon! We have now started our next tour, this is a photographic tour with Glenn Bartley and his group. We are spending 5 days in the Atlantic forest at Itororo Lodge and then moving onto Chapada das Guimaraes and then onto the Pantanal. 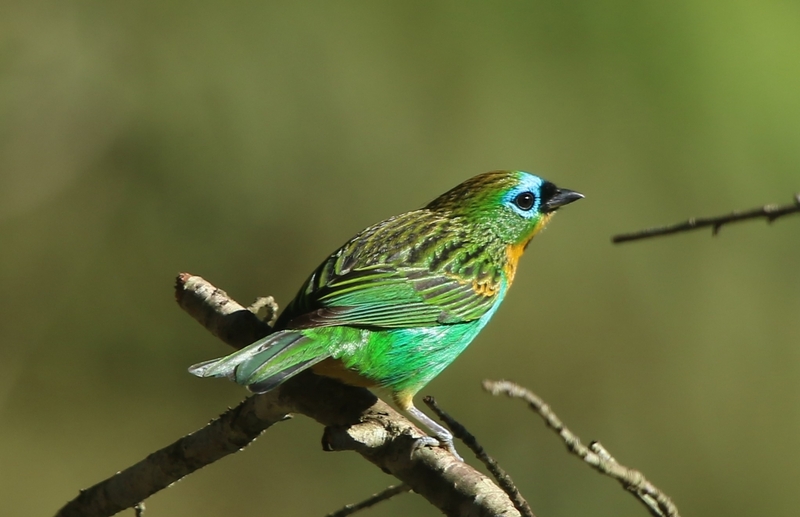 We had a good morning, the feeders were quite busy with visits from Magpie Tanager, Brassy-breasted Tanager (pictured below), Burnished-buff Tanager, Ruby-crowned Tanager and Rufous-bellied Thrush.